Power line corridor. File photo. New Hampshire's Site Evaluation Committee starts deliberating the fate of Northern Pass in less than two weeks. But whatever decision it makes likely won't be black and white. In final briefs filed last week, 16 of the 19 stakeholder groups that intervened in the Northern Pass case asked the SEC to reject the project. 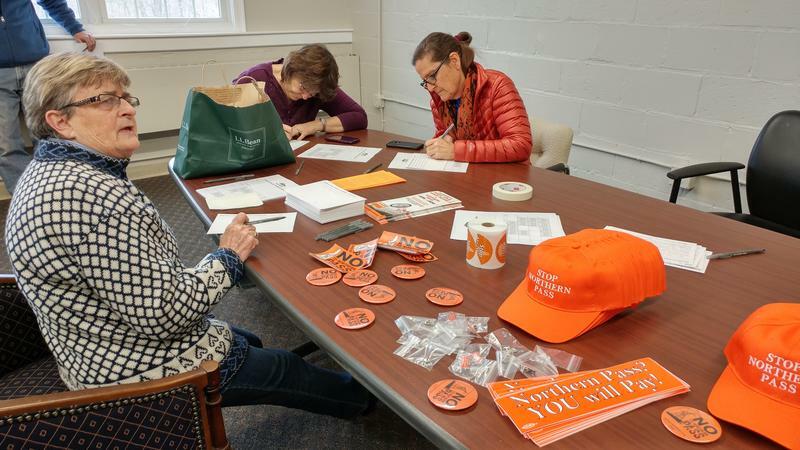 Those opponents include groups like the Society for the Protection of New Hampshire Forests and the New England Power Generators Association, as well as neighbors and towns along the transmission line’s proposed route. They argue evidence the SEC has heard shows Eversource's application is faulty and didn't prove the power line would serve the public interest. One intervenor, a group of businesses, wants the project approved outright. The city of Berlin wants it approved on the condition that Eversource pays for local utility upgrades and North Country economic development. The counsel for the public in the case didn’t take an official stance, but its final brief questions Eversource’s long-term economic arguments for the project and expresses concerns over a range of other missing details. That brief also suggests conditions if the SEC approves the project, including the local utility upgrades Berlin wants, independent monitoring of wildlife impacts during construction, local control of road permitting, and more. Route of the proposed Northern Pass, with highlight of the WMNF area. 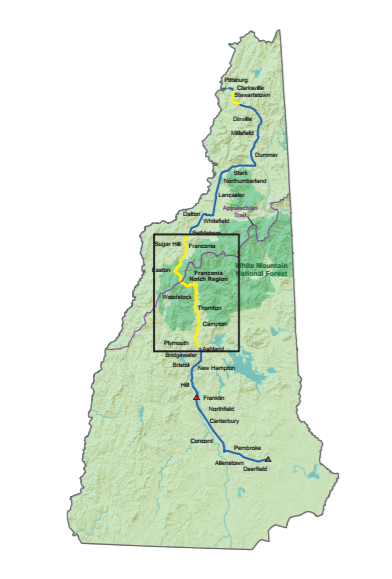 Northern Pass, which received its main federal permit in November, is a proposed $1.6 billion, 192-mile transmission line to deliver power from Hydro-Quebec to New England. The route goes to an existing substation in Deerfield, N.H., with a new converter terminal to be built in Franklin. 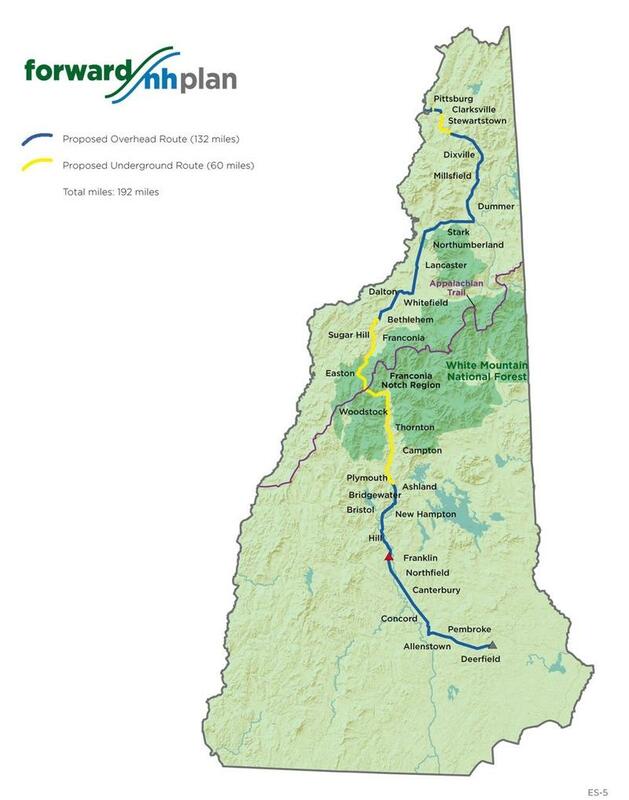 An estimated 60 miles of the line will be buried underground, in the vicinity of Franconia Notch and along part of the Appalachian Trail in the White Mountains, according to Northern Pass, a project and subsidiary of Eversource Energy. In its final brief, issued Jan. 19, Eversource says it will provide those utility upgrades and economic development funding in the North Country. and that permitting the project will serve the public interest. Eversource says in the summary of its final brief that the project's economic benefits, "together with the lack of any negative impact on community services and infrastructure, isolated impacts on property values, and short-duration, limited impacts on tourism," mean it won't hurt the region's development. And they note the Department of Energy has said "the average scenic impact of the project will range from very low to moderate." The SEC will now go through all these reams of evidence, months of testimony and years of other records, amounting to the most extensive siting process in state history, to decide if Northern Pass passes those tests. That record includes more than 4,500 written comments and petitions, fewer than 200 of which were in favor of Northern Pass, according to the counsel for the public’s final brief. Committee deliberations begin Jan. 30, with an oral decision expected by Feb. 23 and a written ruling due out in March. "They know that whatever decision they make, they're going to make someone unhappy,” says Forest Society spokesman Jack Savage. He says the committee could deny Northern Pass and tell Eversource why, setting up a possible re-application with a revised plan. Or the SEC could approve the plan, provided Eversource meets certain conditions. Savage says it’s unclear how simple or complex those might be. At least four of the committee’s seven members have to agree on the final ruling. After their written decision, Eversource and the intervenors would have 30 days to ask the SEC to reconsider. If the committee doesn't want to do so, the case would go to the New Hampshire Supreme Court – further prolonging an already years-long battle. 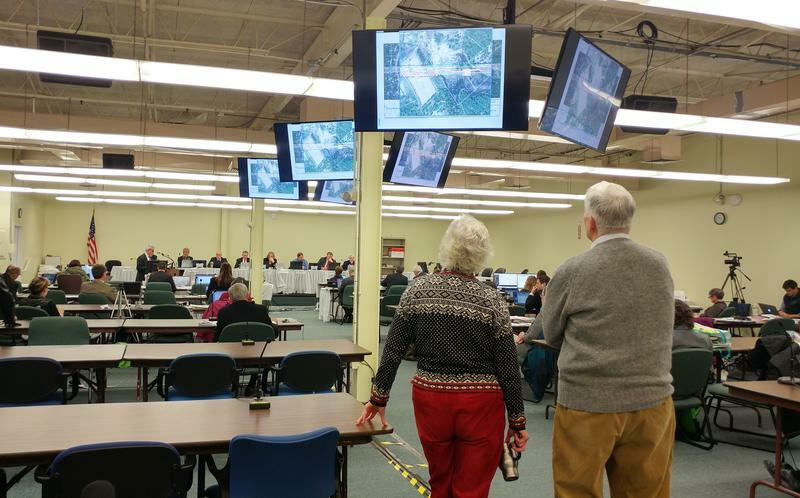 This story has been updated to include details from Northern Pass's final brief. The final witnesses gave testimony on the Northern Pass transmission line Thursday, after eight months of hearings and years of planning. Day 70 of adjudicative hearings at the New Hampshire site evaluation committee centered on wetlands and property values. Ray Lobdell, with the Society for the Protection of New Hampshire Forests, testified in the morning session on whether Northern Pass would affect more sensitive habitat than expected. The state has three weeks of hearings left before moving into deliberations on the Northern Pass project – so opponents are gathering last-minute comments from residents on the power line's proposed route. 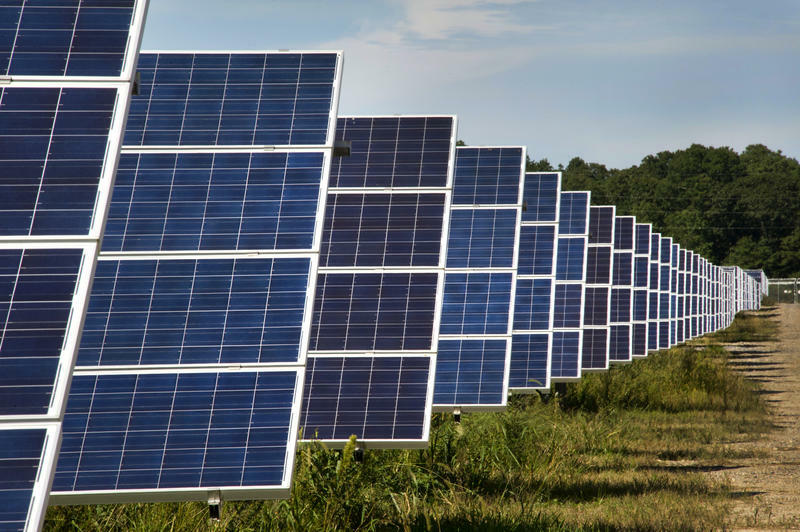 Construction of the state’s largest solar array is set to wrap up by the end of the year. 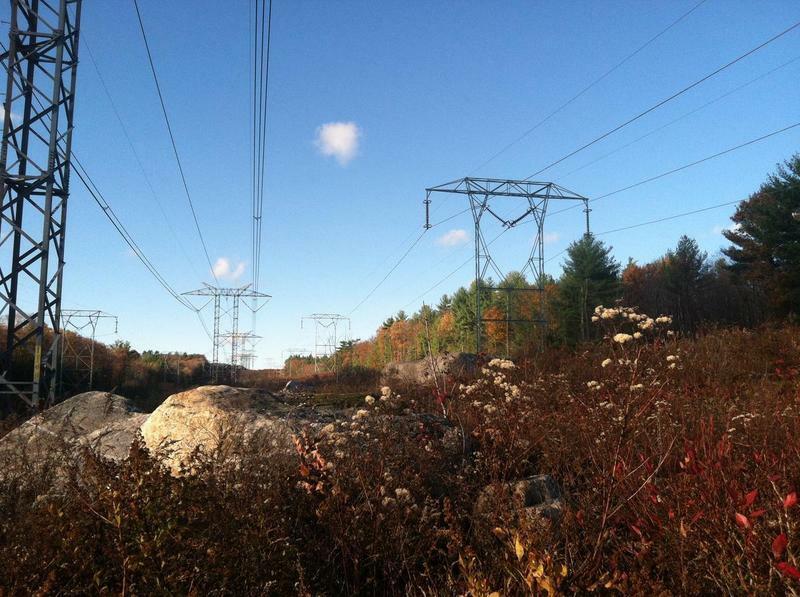 The project, in Moultonborough, will help power the New Hampshire Electric Cooperative's grid. The array is the first energy source the Electric Co-op will own and operate itself -- it buys the rest of its power for its 84,000 customers, in 115 towns across the state, on the open market. The new solar project will only cover about 1 percent of that load, but spokesman Seth Wheeler says it’s a long-term investment.